In a previous role of employment, I have represented my own clients in court hearings and can therefore really empathise with what you could expect to gain from attending court as a legal secretary yourself. Physically leaving your law firm for a while, to undertake this nature of work, is highly motivating and interesting and a side to the role of a legal secretary that surpasses all others. If your interest is starting to be heightened through reading this article, here are a few pieces of advice on what you might like to do to prepare for attending court as a legal secretary and a brief overview of the skills that you would be expected to display once you get there. First and foremost, it is imperative that you gain a good appreciation of how our courts operate in England. Bear in mind that there are different courts for civil law (county courts) and criminal law (magistrates and Crown courts). The type of court you would attend as a legal secretary will very much depend on the nature of the work your law firm handles. Many law firms are quite generic in the sort of work they may take onto their books; therefore you may well be called upon to attend any type of court. Obviously, it would be highly unlikely for any law firm to send you off to court if you were not aware of the way in which our legal system and the courts operate. Therefore, you really must take on a course that provides you with all of this knowledge. This is where The Institute of Legal Secretaries and PAs comes in; the Legal Secretaries Diploma covers all of the pertinent information you need on this subject, as there is a complete section devoted to the way in which the English legal system works. Once you know exactly what to expect when attending court as a legal secretary, you will be set to open a door to a very exciting part of your employment. You can rest assured that you are likely to be saving your employer a considerable sum of money, as you are quite capable of handling hearings in court that are often covered by ‘fee-paying’ members of staff. You are freeing up their time so that they are better utilised elsewhere: capitalising on revenue for your firm, which is entirely the name of the game in any business at the end of the day. Attending court as a legal secretary is all about being the most organised individual you could ever imagine. You will learn that it is vitally important for you to make notes of the timings of hearings (e.g. start, adjournments and finish (for your firm to be able to invoice accordingly)) and record how the case is progressing, with special attention being paid to the overall outcome (judgment) in the case. You will also need to be on hand for the counsel who has been instructed to present the case on behalf of your client. Obviously, excellent secretarial skills are a prerequisite of attending court on behalf of your firm, and this is a time when you will have to ensure that you dot all the I's and cross all the T's. You will also have a duty to ensure that the firm’s client is well looked after and kept informed about how the case is progressing at all times. 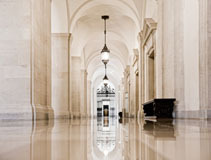 From your earliest days of attending court as a legal secretary, you will be well placed to build rapport with the client over how intimidating this environment can be and you can do your level best to put them at ease and make sure that they are aware of their counsel and exactly what the counsel will be doing for them in court on the day of their appearance. Crucially, if the counsel fails to go into too much detail over the order or judgment made, you are on hand to explain things in layman’s terms. Our Senior Tutor, Amanda Hamilton, runs an established a comprehensive and practical court training programme through her company, AH Paralegal Training Ltd. If you wish to find out more information about this course, visit the following website: www.ahparalegal.co.uk.